Absolutely Intriguing Insights on What President Ishaq Khan May Have Taken to his Grave? EDITORIAL: GIK: has he taken a big secret to his grave? Ghulam Ishaq Khan (1915-2006) was a much more substantive man than today’s politicised and polarised Pakistan can ever fathom. He was a prodigy as a boy and never let his brilliance die down as he grew into a self-made man who was tough to beat in anything he touched. He hailed from a village in Bannu, joined the civil service at a humble level in the NWFP, and rose steadily until he was made finance minister by General Zia ul Haq. In 1985 he was elected chairman of the Senate and took over as president under the Constitution in 1988 after General Zia’s death in an air-crash in Bahawalpur. Mr Khan was an 8th Amendment president who ruled in tandem with the army chief and the elected prime minister in the form of a ‘troika’ that effectively eclipsed the power of the elected politicians. 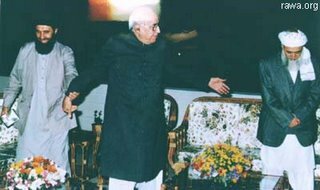 He weighed in with the army chief, General Aslam Beg, and conspired to dismiss the PPP government in 1990, but he also prevented Aslam Beg from taking over as a military dictator by nominating his successor General Asif Nawaz six months in advance. He then fell foul of the PML government too and dismissed Nawaz Sharif because the latter was getting too big for his boots, only this time to see Nawaz reinstated by the Supreme Court. The army eventually had to get rid of both GIK and Nawaz Sharif to break the deadlock and consequently usher in another PPP government in 1993. After this, GIK disappeared from public life and kept his mouth shut, unlike most other players on the national stage, some of whom have said more than they should have while still in office. Has he told his story in a memoir to be published posthumously, or has he taken answers to some very important issues of his tenure to his grave? The death of General Zia, whom he buried symbolically in a mosque built by a Saudi king, even though the place was not meant for burials, is still unexplained. Was there something in GIK’s decision to bury Zia in the Faisal mosque that we haven’t grasped? Consider. GIK as president inherited Pakistan’s nuclear programme from Gen Zia and took it to his heart. But he was quickly aware of the ‘new thinking’ of COAS General Aslam Beg and his ‘strategic defiance’, which effectively meant saying goodbye to the Arabs as ‘slaves of America’ who had given jobs to hundreds of thousands of Pakistani workers and had bailed Pakistan out when the money was tight in Islamabad. GIK knew that Gen Zia was fighting his sectarian war with Iran when he was killed. In 1986 Gen Zia let the Turis of Parachinar be massacred because they were going to Iran to take military training. In April 1988, Gen Zia unleashed Sunni fanatics on the Shias of Gilgit and then calmly shrugged off the killing of Shia leader Ariful Hussaini in Peshawar. If he was inclined to ‘cooperate’ with Iran with his nuclear programme in the beginning, he had plumped for the Arabs in his last days. But GIK saw that Gen Aslam Beg had got close to Dr AQ Khan when he was vice chief of the army. By 1989 GIK knew that the deal AQ Khan had made with the Iranians in Dubai in 1987 had not been cleared with Gen Zia and that perhaps he also knew that three million dollars in Swiss francs had changed hands. As GIK’s relations with the Benazir government soured he knew that Gen Aslam Beg too was flying off the handle over the Gulf war, objecting to Pakistani troops defending Saudi Arabia and predicting that America would lose against Saddam Hussein and that that would break the stranglehold of the United States over the Middle East and bring dishonour to those like Saudi Arabia and Egypt who were “America’s slaves”. Pakistan’s big secret is the death of General Zia. Is there enough circumstantial evidence to support the speculation that Gen Zia died because of a secret pro-Iran nuclear policy followed from within the army which its supporters didn’t want ended, and which General Zia was about to unearth? GIK sensed the recklessness and extremism of Gen Beg and joined Prime Minister Nawaz Sharif who was already greatly embarrassed by Gen Beg’s antics over the Gulf War and decided to get rid of him before he could make his position permanent. As Gen Beg bragged about selling the nuclear programme to an American ambassador, GIK was quick to appoint his successor. After that GIK also prevented Prime Minister Sharif from getting the next army chief of his choice: from the list of three he ignored General Hamid Gul and thus saved Pakistan from another anti-American adventurer. The burial of General Zia inside the Faisal mosque was a symbolic gesture. It pointed to the choice made by Zia between Iran and Saudi Arabia. Zia had earlier named a city after the same king. Laying Gen Aslam Beg aside showed which way the wisdom of the old man had led him. That may be why Gen Zia’s son Ijaz ul Haq has never stopped complaining that Gen Aslam Beg had something to do with his father’s killing. Gen Beg’s own statements after the incident appeared contradictory. GIK knew that Pakistan’s nuclear programme was of national importance and he must have realised soon enough that there was a division about it in the army. He guarded it against all odds by keeping close to Dr AQ Khan but he must have disagreed with what Gen Beg wanted to do. What did he feel when Gen Zia was suddenly removed from the scene? The death of Gen Zia meant victory of the ‘defiant’ doctrine promoted by Gen Aslam Beg. Was Gen Zia killed because he was on the brink of knowing the change of direction others in the army had initiated? Was this big secret about to come out? No one in Pakistan knows for sure except that the army under Gen Beg and even afterwards prevented proper investigation into the 1988 air crash. Thus it is possible that, again for the sake of Pakistan, GIK kept quiet about what he knew. Maybe he has taken Pakistan’s biggest secret to his grave.